There are 3 portable toilets and showers located in the glamping paddock. Please note that there are no cooking facilities on site so why not unwind, relax and head to one of the many dining options on site or in the area. We now offering midweek and weekend Ferry Packages! Finish work and head to the Docklands to await your ferry to the beautiful Bellarine Peninsula. Grab a drink and enjoy views of the bay from the deck! Upon your arrival at Port Arlington, there will be a mini bus waiting to pick you up and take you 5 minutes down the road to Terindah Estate winery, where you will be greeted with a delicious picnic hamper (including farmers meat produce platter, chicken and tarragon terrine, fresh sourdough bread, Manzanillo olives, dried and fresh fruits). Why not treat your self to a bottle of sparkling whilst your there! Enjoy your picnic hamper amongst the vines, on the private beach or in your beautiful bell tent where you will stay the night. Enjoy the sights and delights and Terindah Estate! The next morning (or afternoon if you are staying over the weekend) your mini bus driver will be there to pick you up to take you to the ferry where you can enjoy the relaxing commute to back to work or a day of shopping in the city! 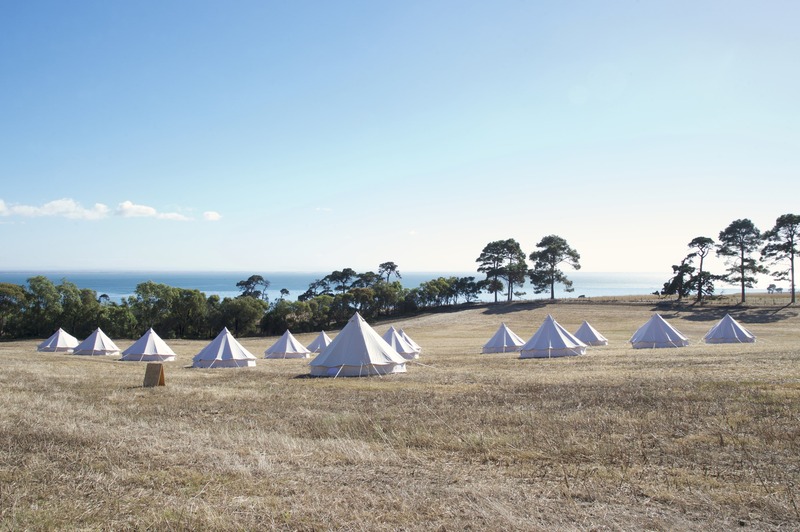 The package includes a return ferry from Docklands to Port Arlington, a return bus journey from Port Arlington Ferry Terminal to Terindah Estate Glamping, a beautiful picnic hamper on arrival and accommodation for 2 people in a luxury bell tent. Are towels and bedding provided? 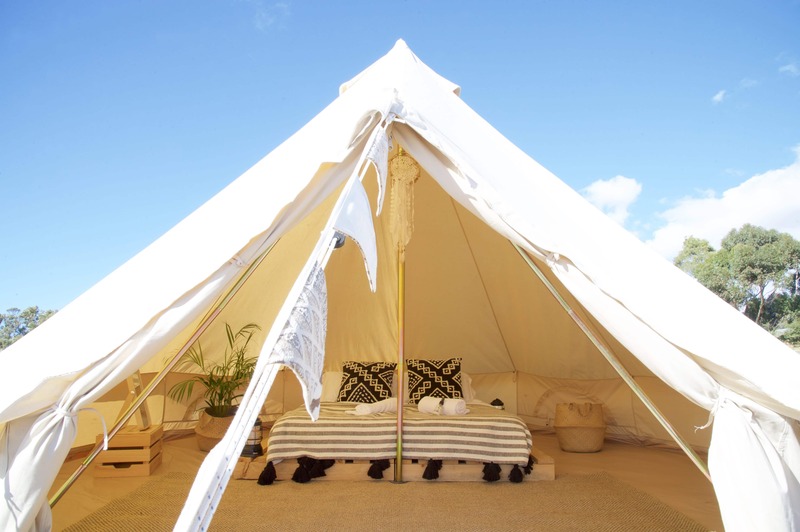 Bed linen, towels and blankets are provided in your bell tent. Are there amenities onsite? Yes, there are 3 portable toilets and 3 showers in the glamping paddock. Do the tents have air conditioning? No, however the tents have zipped windows and doors with flyscreens to allow airflow. What should I bring? Bug spray (This certainly is glamourous camping but you are camping in a field, we do out very best to keep the tents bug fee but please bring bug spray), sunscreen, toiletries, warm clothing for at night, bathers (for swimming in the bay). Can we bring our own food? You can bring your own snacks but there are no cooking facilities on site. Please ensure you bring sealable containers for food to prevent unwanted guests entering the tent. Can we buy water on site? Pop in to the cellar door for complimentary bottled water, if the cellar door is closed there are shops in Port Arlington or Drysdale. Is there power in the tents? There is no power in the glamping paddock, however you can charge your phone with our USB lanterns inside the tents. Is there Wifi on site? There is guest Wifi up on the deck and in the cellar door. There is not wifi in the glamping paddock. Is there security on site? There is no security on site. Padlocks are provided with each tent. We’re bringing an esky, where can we get ice from locally? There is a Coles, Aldi and bottle shop in Drysdale, 5 minutes away from Terindah Esate. Can we buy food at Terindah? You can enjoy the delicious food on The Deck or in The Shed restaurant at Terindah (check Terindah Estate website for opening times as these change depending on season). There are no shops or vending machines on site. There are shops in Port Arlington or Drysdale which are just a short 5 minute drive away.